Rozalia Albert Juhaszne was born in 1928 Born in Transylvania, Csikszentdomokos, Romania. 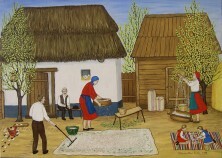 She moved to Szabolcs, Hungary in 1944 and worked as a seamstress from 1961 to 1983. A self-taught artist, she began her artistic career in 1970 and in 1980 was discovered by Dr. Bansky.